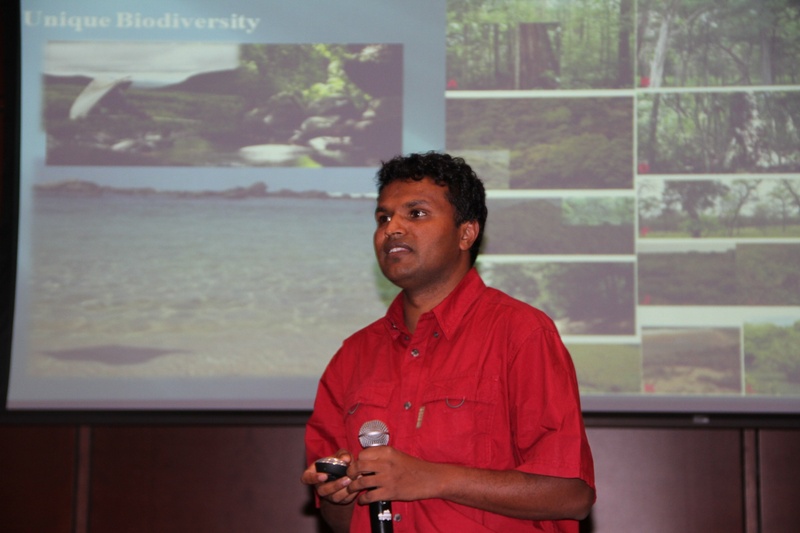 For the past month, Chamindha Mahanayakage, Sri Lankan field environmentalist and photographer, has had the opportunity to share his passion for the environment and his country with the Elon University community and beyond. Visiting the United States as the Elon Periclean Scholar in Residence, Mahanayakage has given the local community a unique look at Sri Lanka, a small island nation off the coast of India, and has inspired local students to practice environmental stewardship. 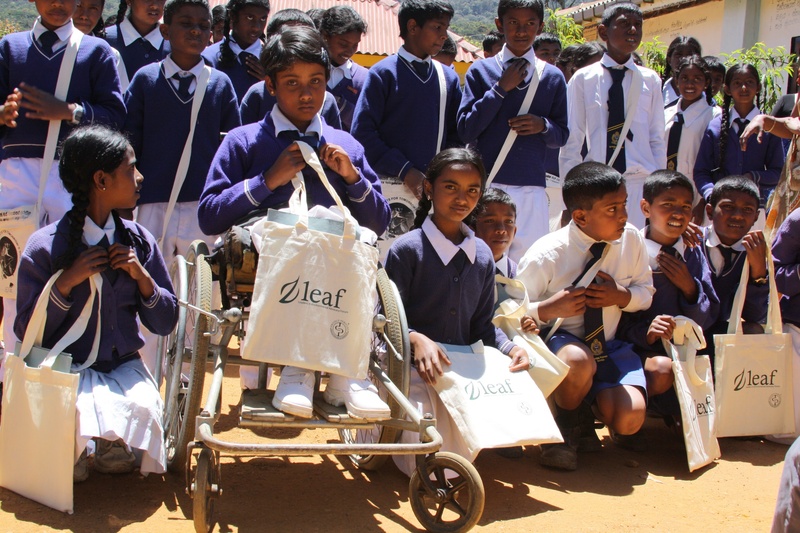 Students from the Seetha Eliya School in Sri Lanka hold bags from the Leaders in Environmental Advocacy Forum (LEAF), the summit hosted by the University of Colombo in January and coordinated by the Periclean Scholars. The Elon Periclean Scholars class of 2011 has been contributing to environmental education programs in Sri Lanka. It was during a trip to the country this January that they met Mahanayakage, who served as their tour guide and translator, and was an asset to the group. Crista Aranagala, Elon professor and Periclean Scholars adviser, hopes the month-long trip marked the beginning of what will be a long-term relationship between Mahanayakage and the Periclean Program. Leman and the 2011 scholars have been sponsoring an environmental club, have created two pen pal programs between North Carolina and Sri Lankan schools and this January hosted a two-day environmental summit held at the University of Colombo. The past month has given Mahanayakage the opportunity to return the favor, interacting with local students just as the scholars did in January. For him, working with young children is crucial. “Doing the environment in the schools is the best place because they are the young generation,” he said. During the past few weeks, Mahanayakage visited Seawell Elementary School in Chapel Hill and Graham Middle School, introducing students to Sri Lanka and the importance of environmental care. “Most of the time I talk about the beautiful wildlife of Sri Lanka, a little bit of heritage and culture,” he said. Eighth-grade students at Graham Elementary have been participating in the Sri Lankan Panangala Mahabodhi pen pal program. Hearing Mahanayakage speak was a unique and inspiring opportunity. Students were also inspired to respect the planet. “If we care for the environment it helps us connect with nature and where we get our food and how we live,” said Jack Parker, an eighth-grader and participant in the pen pal program. Chamindha Mahanayakage discusses Sri Lankan ecotourism with a group of Elon students. Mahanayakage was the world’s first photographer to capture an image of the Horton Plains Slender Loris, an endangered mammal. Mahanayakage also interacted with the Elon University community, speaking about his experiences with the Slender Loris Conservation Project and providing a fresh perspective on the environment and wildlife conservation. For Leman, Mahanayakage’s visit speaks to Elon’s commitment to international and engaged learning. “Bringing that diversity of opinion can change your thinking about things, because it gives you such a different perspective that you wouldn’t have thought about,” she said. For more information on what the Periclean Scholars are doing in Sri Lanka, visit their website. Originally published in the Burlington Times-News, April 23, 2011.